After the Nazis came to power in Germany on January 30, 1933, the Nazi leadership decided to stage an economic boycott against the Jews of Germany. In 1933, about 600,000 Jews lived in Germany, less than one percent of the total population. Most Jews in Germany were proud to be Germans, citizens of a country that had produced many great poets, writers, musicians, and artists. More than 100,000 German Jews had served in the German army during World War I, and many were decorated for bravery. Jews held important positions in government and taught in Germany's renowned universities. Of the 38 Nobel Prizes won by German writers and scientists between 1905 and 1936, 14 went to Jews. Marriage between Jews and non-Jews was becoming more common. Although German Jews continued to encounter some discrimination in their social lives and professional careers, many were confident of their future as Germans. They spoke the German language and regarded Germany as their home. On April 1, 1933, the Nazis carried out the first nationwide, planned action against Jews: a boycott targeting Jewish businesses and professionals. The boycott was both a reprisal and an act of revenge against Gruelpropaganda (atrocity stories) that German and foreign Jews, assisted by foreign journalists, were allegedly circulating in the international press to damage Nazi Germany's reputation. 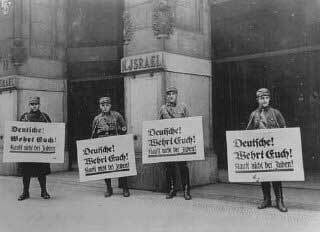 On the day of the boycott, Storm Troopers (Sturmabteilung; SA) stood menacingly in front of Jewish-owned department stores and retail establishments, and the offices of professionals such as doctors and lawyers. The Star of David was painted in yellow and black across thousands of doors and windows, with accompanying antisemitic slogans. Signs were posted saying "Don't Buy from Jews" and "The Jews Are Our Misfortune." Throughout Germany, acts of violence against individual Jews and Jewish property occurred; the police intervened only rarely. Although the national boycott operation, organized by local Nazi party chiefs, lasted only one day and was ignored by many individual Germans who continued to shop in Jewish-owned stores, it marked the beginning of a nationwide campaign by the Nazi party against the entire German Jewish population. A week later, the government passed a law restricting employment in the civil service to "Aryans." Jewish government workers, including teachers in public schools and universities, were fired. Sources: United States Holocaust Memorial Museum. Photo from National Archives.